A beautiful September Claddagh birthstone pendant & chain. This lovely pendant is made from sterling silver. It features a halo effect, encrusted with Swarovski® white crystals which meet the cuffs of the Claddagh emblem. The Claddagh hands hold a Swarovski® sapphire blue crystal stone in the centre with a detailed crown on top. This beautiful Irish September Claddagh birthstone pendant & chain would make the perfect gift for someone you love. The Claddagh is a sign of love, loyalty & friendship. 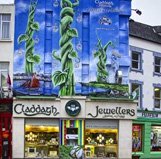 Claddagh Jewellers – The Celtic Jewellery Specialists. - From Galway with Love!